NEW Gentle Formula! Tork Premium Hair and Body Liquid Soap is an effective 3-in-1 cleanser delivering rinsing shampoo, body wash and skin cleanser in one product. A special combination of conditioners and ingredients moisturize and soften the skin. 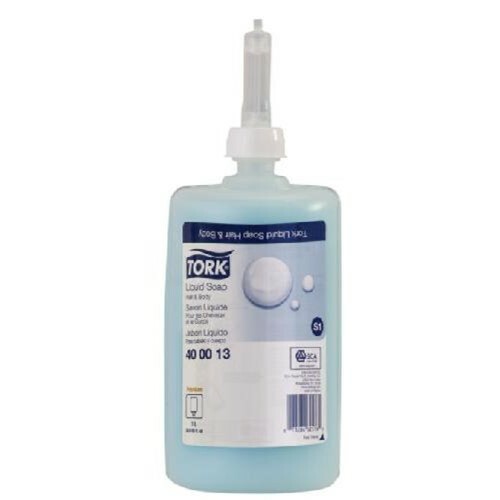 Suitable for Tork Skincare dispensers for soap and hand sanitizers, with proven easy-to- use design, promote good hand hygiene for all visitors. Provides a 3-for-1 conversion in facilities using separate items to achieve the same results more efficiently. High capacity - allows for 1000 doses, providing for portion control and preventing overuse. Refilling done in 3 seconds, conveniently allowing ?? ?load and flow???. Bottle is made from recyclable plastic and fully collapsible to reduce waste 70%, providing environmental benefits and a positive image builder.